It's the teeth that strike you first. Tommy Steele's choppers arrive before the rest of him: a chaser of mischievous blue eyes and a very British mop of sandy hair. He looks like Ringo's cousin. Or Paul's. In fact he preceded them by a good five years, generally regarded as UK's first rock 'n' roll star, who charted in England even before Presley. A movie bio was made when he was barely 21. By the early '60s, sensing the growing competition, his ambitions shifted to the stage, and in March '63, as the Fab Four were still coming to prominence, Steele took on the West End in a vehicle specifically tailored to his talents, Half a Sixpence--defiantly based on a turn-of-the-century pastoral adventure, Kipps, by H.G. Wells, the reknowned sci-fi writer, who wrote equal amounts of non-fiction on a mind-blowing variety of subjects, as well as novels of every stripe. Kipps was one of Wells' bigger successes, but was far less remembered 60 years later than some of his other works. It was a rags-to-riches-to-rags saga that proved a good fit for Steele, who among his other talents played guitar and a mean banjo. In Wells' novel, on learning of his inheritance, the first thing Kipps buys is--of course--a banjo. Song cue, anyone? The score was by David Heneker--an interesting chap who started composing songs while in the British army, and began his career in earnest only in his 40s. After initial success in 1958 with a London tuner called Expresso Bongo, he and partner, Monty Norman were engaged to adapt book & lyrics of a provincial French hit into English. Irma La Douce was a bigger smash, and came to Bway; the first of a slow trickle of musicals arriving from the West End. Initially inspired by Noel Coward's Bitter Sweet, Heneker composed in a more pop idiom, reminiscent of Vincent Youmans or Jerry Herman. He followed Sixpence with an even bigger London smash, Charlie Girl, which despite its loosely "mod" Cinderella motif, wasn't risked on a transfer to America. Charlie was another collaboration, but Sixpence was entirely Heneker's score--and his last to play Bway. The libretto was by the much younger Beverley Cross, an itinerant playwright & screenwriter, who was later Maggie Smith's husband for 23 years. Cross & Heneker meant nothing as names for Bway and Sixpence was risked, not by David Merrick who was regularly sending packages over from Britain, but by its London producer, Harold Fielding, looking to cash in on the market for imports. You could say that Kipps was born to play Steele, rather than the other way around. As a tailor-made vehicle it couldn't have been tighter. The former "English Elvis" tirelessly performs nine numbers--absent from but two (It's one of the biggest roles in any musical) including four immense production numbers that constitute the only word-of-mouth the show really needs. In an era when British musicals were still rarely exported to New York, Half a Sixpence was considered less for its product than for the crossover potential of Steele at a time when the British were taking over America again. The show came to Bway in April '65, late in a season that began with Fiddler on the Roof, then steadily delivered one disappointment after another: Robert Preston as Ben Franklin in Paris, a singing Sherlock Holmes in a lavish Baker Street; Chita Rivera's gypsy-ganza, Bajour; even Sammy Davis's Golden Boy and the pedigreed Rodgers, Sondheim & Laurents' Do I Hear a Waltz? were found lacking. Upon these heels, Half a Sixpence arrived; bright, fresh, unpretentious, and full of springtime spirits. 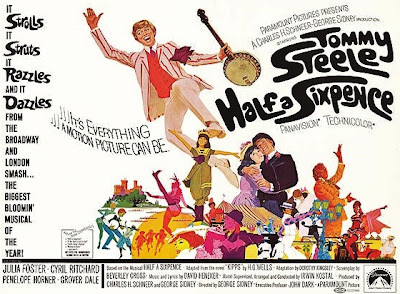 Steele's non-flagging energy was hailed and Hlwd took quick notice, with first Disney then Warners and Paramount signing him up for musicals, including a deal to film his Bway show--on location in England, no less. You can tell they were hoping they'd found the male Julie Andrews. Instead he turned out to be the cockney Carol Channing; a smile too frequent, a look too wide in innocence or mischief; a relentless energy. Like Channing, he's too big for the movies; those goony looks, that unavoidable overbite are more distracting than inviting. (It doesn't help, either, that now he looks frighteningly like Ellen DeGeneres.) Steele first broke on American screens in The Happiest Millionaire, Walt Disney's final film the 1967 Christmas movie at Radio City Music Hall. (Curiosity got the best of me and I finally watched it--and what an eye-opener it is; a creaky three-hour musical, for children, whose takeaway song is a paean to getting shitfaced drunk--and this from Disney! The surprise is how much it adheres to a strict R&H model of integrated score--tho a lousy one. Sixpence is far more casual, allowing for irrelevant detours in its production numbers.) Hampered by a dull script and dreadful score by Disney regulars, The Sherman Bros., Tommy S (as the newly immigrated Irish butler) comes across far better than non-singers Fred MacMurray, Geraldine Page and Greer Garson, and has an impish subtlety he quickly lost upon recreating Arthur Kipps. 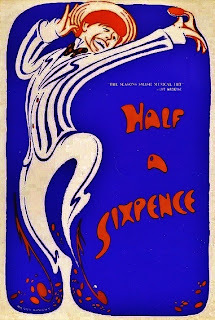 But at least Paramount bought Half a Sixpence with the understanding that Steele was the show (unlike the ill-advised Stop the World taking the equally bespoke Anthony Newley vehicle and using an understudy: Tony Tanner, who, coincidentally, was also the final Kipps on Bway, following first replacement, Joel Grey.) Paramount hired veteran MGM musical director, George Sidney (who directed five musicals we've already covered), and most recently had put Ann-Margret thru gyrations in both Bye Bye Birdie and Viva Las Vegas., to helm Sixpence. Paramount was one major studio that stayed out of the high-end musical game for most of this age; their only previous Bway purchases after 1950 were Hazel Flagg (which was reconfigured for a Martin-Lewis fling) and Li'l Abner--only because their own contract producers were also the Bway authors. Paramount confined its musicals to every other programmer for The King. Elvis movies, cheap as they were, and artistically deficient, were still making good money. Who needs to make big-budget Roadshows? But after The Sound of Music, it became imperative, and Sixpence was their roll of the dice, elevating Steele, whose own first teen musicals were low budget British indies, to the Julie Andrews treatment. Aside from smilin' Tom, the supporting cast is relatively lackluster. Neither Julia Foster nor Penelope Horner leave much impression as Kipps' two women, and except for his brief bursts of dancing, Grover Dale--the one other recruit from Bway--is nearly color-less. His sole distinction is possession of the longest legs prior to Tommy Tune. On Bway, the hammy actor, Chitterlow, earned James Grout a Tony nomination. (He's as unknown to me as I'm sure he is to you), so by that measure upgrading the role on screen would be Cyril Ritchard (Peter Pan's Captain Hook--and the campiest one ever) Tho it is one of his more restrained performances, Cyril does try our patience, enacting campy melodramas for Kipps within seconds of meeting him. But Ritchard was a stage actor primarily (another one too big for the screen); and this was his only film appearance after 1948. It was also the final film for director George Sidney. He was only 51, but had directed features for 25 years, among them: The Harvey Girls, Annie Get Your Gun, Anchors Aweigh, Show Boat Kiss Me Kate and Pal Joey. By 1968 his brand of cinema, as Sixpence proved, was passe. I'd like to think he quit by choice, not dismissal; for he lived another 35 years. graphed to convey any hint of spontaneity; which again makes askew what should be inviting. Oddly, the movie reinstates two run-together songs (from London, but cut for Bway): "I Don't Believe a Word of It" and "I'm Not Talking to You," that are more script-driven than any other in the show. There's a strong suggestion of Oklahoma's "Many a New Day," and beach scenes hint at High Button Shoes. Its a striking scene, because its so different from the rest of the film, even if the songs are musically tepid. The sequence records Ann's tantrum and subsequent spurning of Arthur, which leads him to pursue other possibilities given to a man of his (newfound) station. And why not indeed? Ann's hissy fit is petty and unjustified, which later makes her public claim on Arthur's affections seem like the whining of an adolescent schoolgirl. But how hoary a device to frame the upper-class beauty, Helen, in blurry iris every time Kipps makes goo-goo eyes at her. Likewise, it's a shame Cross's scripted scenes don't have more bite. Kipps' extended tea with the Walsingham's is deadly and obvious where it should be funny--even touching. Kipps seems to get coarser and more stupid as the story progresses--unintentionally, I would presume. The next of the show's tentpoles is the charm song, "If the Rain's Got to Fall" in which Kipps anticipates a date with Helen. The song, which initially suggests "Once in Love With Amy" from Where's Charley? has Steele tripping the light fantastic in a riverside park. But again this turns into a proscenium-fit dance sequence, the nearest the show gets to ballet. It starts with a rag-tag band of kids (so professional they must be refugees from Oliver); moves on thru a parasol parade, and concludes in a downpour. Which makes no sense. We know why he's singin' in the rain--he's besotted! But all the others? Carelessly frolicking in their best Sunday finery; getting soaked to the skin? Oh, please. That said, it's a highlight of the movie, no doubt; but you know it doesn't stir the pot like it did on stage. Capping the first act is a team rowing competition, with the first of two new songs, "The Race is On," replacing "The Old Military Canal" from the stage score. "Race" is one of several songs, including the ballad "Long Ago," that are played over active scenes and not sung thru any particular character, tho here the vocal is by Steele. Intermission follows Ann's childish meltdown, leaving Kipps to pick up her discarded half-sixpence in the rain. Curtain. There's no getting around the fact that this is a decidedly old-fashioned, even twee, piece of material. But George Sidney attempts some anachronistic, if not quite modern, techniques to jazz up the film. A rapid montage of stills to convey the working day at Shalford's (and wouldn't this scene have made a better song than "Economy"? ); jerky edits in lieu of gradual camera pullback; a dab of animation to show varying dream houses; a whole song done in cardboard setups of "olde" postcards ("A Perfect Gentleman"). Sadly, none of these bits make the film any hipper. The second act runs some 15 minutes before another song. But it's probably the best in the film; a celebration of the wedding photo: "Flash, Bang, Wallop!" The scene owes a lot to Cukor's "Get Me to the Church on Time" from MFL. There's a similar Edwardian pub-crawl feel, and a raucous dance perfectly framed--but too little too late. Prior to this we slog thru Kipps, with new fiancee, Helen, taken to Downton Abbey (like Eliza to Ascot) and predicatably proving an embarrassment. By coincidence, Ann is also in attendance, as a servant--and coming to her defense, Kipps insults hosts and guests alike, and runs off to propose to his childhood bride--who even after this moment of chivalry acts more petulant than grateful. The fault isn't entirely Julia Foster's, but her Ann is really awful; immature, strident, quite the shrew, without entitlement to be so. She's one of the least appealing musical heroines I can think of. Even her solo is less an expression of feeling about love or hope, but a rejoinder to the very idea of self-improvement--the title says it all: "I Know What I Am." You sure can't say the same for Kipps, not from his perspective or ours. He crudely dismisses the privileged class (but doesn't curry our sympathy by taunting violence), then once married to a servant girl he not only courts the upper classes, he berates Ann for her failure to share his enthusiasm. Whatsmore, his current home, inherited from his grandfather, seems palatial enuf already--certainly for someone who's slept most of his life in a cellar. And how unsporting of Kipps to be building an 11-bedroom mansion while his old best buddies are left to slave for Shalford. Once he learns the fortune is lost, however, he regains perspective, and finds his (and supposedly our) values. On Bway. this led to the final production number, "The Party's on the House (Altho There is No House"). The song was a Bway replacment for two songs in London, "I'll Build a Palace" and "I Only Want a Little Home," and presumably more of a rabble-rouser--it certainly sounds it on the cast album. It's puzzling why they cut this for the movie, especially to substitute a second newly written tune, "This is My World," a pointless fantasy sequence for Kipps to come to his senses and forget his taste for wealth and society. Everything about it is lousy, and it sure doesn't cap a long movie with a last burst of energy. Of course the final twist is that another of Kipps' investments (in actor Chitterlow's musical play) has paid off big. But Kipps has learned his lesson, and we can all relax, for "half a sixpence, is better than half a penny, is better than half a farthing, is better than none." Such Protestant modesty. And suddenly you wonder if musical comedy was invented to reinforce middle class values. What do the simple folk do? Why they sing and dance and whistle show tunes, god bless their souls. And they flock to period-set Roadshow musicals. Except they didn't come. Not to the movie, at least. The show ran for 15 months on Bway, and didn't recoup until after the subsequent national tour. But the movie, opening at the Criterion Theater in Times Square on Feb 20, 1968, was universally panned and struggled thru a mere eleven weeks as a Roadshow. I was scarcely aware of the film's run at Grauman's Chinese (which was even shorter) as that winter of '68 was eventful for me on many other accounts. For one, I had just begun high school (L.A's school year began in January--which makes sense if you think of it--and h.s. started not with 9th but 10th grade). By then I was firmly in the closet. Not for sexuality (I was still fantastically naive and unconcerned with that), but for my secret Bway worship. As an only child whose parents let me pursue what I fancied, there wasn't much I needed to hide. But among my young peers it was clear I was riding another cultural bus in the era of acid rock and The Beatles. Our graduating Junior High class song was "Light My Fire" by the Doors. Who else but me was listening to Henry, Sweet, Henry or I Do! I Do!? I doubt even my newest best friend, Larry Shevick was privy to my private pursuits, tho he was just as enamored as I of superficial things; glamour, wealth and success. I went with his family to Las Vegas that April, the first time I laid eyes on that neon moonscape. Seduced as I was, we were still underage (one of our activities was to go see the Roadshow movie in town: Gone With the Wind.) and I didn't return for another 14 years--having forgotten the desert lure while pursuing other passions in New York and San Francisco. To be 15 years old at that time was to see change roaring up all around. The year's horrific political assassinations, race riots, Vietnam protests, the war on nightly TV news; and then our own rug pulled from under us: my father's new job in San Jose. Like most of his eternal secrecy, I don't think even my mother knew exactly why he was laid off from his low-level aerospace-engineer position at Rocketdyne (I'd spectulate it was an inability to play with others); but he had struggled for more than a year finding another position, even spending some months in Waco, Texas--which thankfully never required our joining him. But Food Machinery Corp. was a settled deal and we were to move north in January '69, tho father would spend more than half a year up there first, living in a small trailer bought for the occasion--and later used for uncomfortable vacations. My response to these events was to bury myself even further into my Bway playground. This was, after all, the first Bway season I was following as it played out, and it was a sorry one at that--tho I hold great affection for nearly all those bombs: Henry Sweet Henry, How Now Dow Jones, The Happy Time, Darling of the Day, even Golden Rainbow--which, while not nominated opened the 1968 Tony Awards, with its opening production number extolling "Vegas," that in retrospect is breathtakingly cheesy, but at the time, nonetheless thrilled my adolescent heart. The season's disappointing offerings (two of the Best Musical noms had closed 3 months prior--and one won: Hallelujah, Baby!) were camouflaged by a parade of personages, some with tentative or long-ago connections to Bway (many being given "special" awards for no particular reason); but a lineup that is likely a benchmark for such a gala: Angela Lansbury, Jack Benny, Audrey Hepburn, Peter Ustinov, Gregory Peck, Liza Minnelli (already a Tony alumnus), Carol Channing, Groucho Marx, Paul Newman, Joanne Woodward, Anne Bancroft, Tony Randall, Sandy Dennis, Pearl Bailey, David Merrick, Harold Prince, Diahann Carroll, Art Carney, Shirley Booth, Helen Hayes, Maurice Chevalier, Marlene Dietrich (who collects her "special" Tony in her best animatronic manner, claiming this the only award she's ever received)--and among those performing: Leslie Uggams, Robert Goulet, Tony Roberts and an unknown Bette Midler singing "Matchmaker, Matchmaker," with her stage sisters from Fiddler on the Roof. (Even here she is unmistakably the future Divine Miss M.) Producer Alexander H. Cohen made a good show of Bway glamour, but the truth was, the Tony's hit TV as the bloom was coming off the rose. The times they were a changin', and Bway was steadily losing its hold on American culture. Contrary to its ad copy "It's everything a motion picture can be," Half a Sixpence was a step and a half in the wrong direction, and tho Hlwd was always getting Monday's news on Friday, they were deep in thrall of investments that were coming down the pike. And fortune and glory were still to be had. New Songs: 2 "This is My World"
Standout Numbers: "Flash, Bang, Wallop!" "If the Rain's Got to Fall"
Worst Ommission: "The Party's on the House"
overture--perhaps the best moments of the film. Weird Hall of Fame: "Money to Burn"